We hope that you’ll consider arriving in Portugal via train or bus, so one of our previous volunteers has kindly written an article containing lots of links that may assist you. Once you are in Portugal, these local public transport tips will help you make your way to the farm. Local public transport only operates in our area Monday to Friday so please plan accordingly. It’s also worth checking Portuguese public holidays before planning your trip. If you think you are likely to miss a connection, it is better to stay in a hostel in a big city than get stranded locally. It would seem obvious, but do make sure you discuss your arrival plans with us before setting off. If you don’t, it’s a long walk to our place with a rucksack and there’s no guarantee that we’ll be here to meet you! If you are carrying a mobile phone, please let us have your number before you leave so that we can contact you during your journey if need be. It’s helpful if you can text us during your journey to let us know all is well. When you have decided when and where you will be arriving locally, we can pre-book a taxi to meet you on arrival and bring you to the farm. You will be responsible for paying for your taxi journey, which will be around 6€ from Sao Jorge da Beira or Unhais o Velho. Although it’s possible to walk here from either, the routes are not well marked and we don’t recommend it with luggage after a long journey. A taxi from Fundão can be pre-booked for around 40€, generally considerably more if you pick one up from the rank. If you need to cancel your pick up, please let us know as soon as possible! If you fail to meet a taxi that we’ve booked for you you’ll still be responsible for paying it. All links at the end of this page. Catch a Rede-Expressos bus or a train from Lisbon to Fundão. The Rede-Express bus station is near Sete-Rios rail station. It’s to the left of the main station entrance, not very obvious until you are close. By train, you need to start your journey at Lisbon’s Oriente rail station. Both can be reached from the airport using the Aeroshuttle service, which leaves from immediately outside the terminal. A taxi to Sete-Rios from the airport recently cost me 9€. On arrival in Fundão you must make your way to the local bus station on Avenida da Liberdade. Note that there are two bus stations in Fundão, and this is NOT the one which Rede-Expressos and other long distance services arrive at. The Avenida da Liberdade bus station is next to the Post Office, Correio in Portuguese. If you exit the train station you will see it on the opposite side of the road, slightly to your left. From the other bus station allow at least 10 minutes walking time. Now, catch a Camara de Fundão bus from Fundão to São Jorge de Beira. 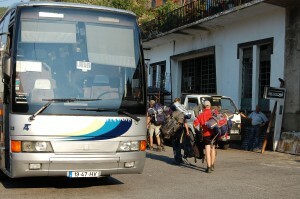 The bus departs Fundão at 18:20 during school term times and 17:40 during the school holidays (approx. mid June – early Sept, please check with us if you are planning to arrive in early September). If you miss this bus there is no alternative public transport route to our farm and you will need to get a taxi from Fundão. You will arrive in São Jorge de Beira at 19:45 termtime and around 19:00 during the holidays. There is a bar by the bus stop. We suggest you wait for your taxi there. Catch a train or bus from Porto to Coimbra. There are lots to choose from. From Coimbra catch a Transdev bus to Unhais o Velho, via Pampilhosa da Serra. There is only one Transdev bus per day, don’t miss it! From the train station, walk towards the city. You will find the Transdev bus station just after McDonalds. The Transdev timetable online is as good as useless. At time of writing the bus from Coimbra to Unhais o Velho (terminating in Meas) leaves Coimbra at 15:45 and arrives at around 18:18. If you take this service, ensure that you are being directed to the correct bus by checking that it will pass through Pampilhosa da Serra. You do not need to get out or change there, but it is a larger town which the ticket office staff recognise the name of. Beware! There is another town with ‘Unhais’ in it’s name that is also served by Transdev but is not close by. If they try to direct you to a bus that leaves at any other time, or does not pass through Pampilhosa da Serra you potentially have the wrong bus. Please, be sensible. Don’t rely solely on us to give you the correct timetable information! We only have the same information available as you do. We strongly suggest double checking timetable information by telephone, or arriving at the bus stop with plenty of time. You should arrive in Unhais o Velho at around 18:20. In addition to national holidays, Pampilhosa da Serra has a local holiday on April 10th.